Happy Wednesday! My Monday was pretty stellar, so even though yesterday was less than stellar, I’m trying to keep those positive Monday vibes goin! 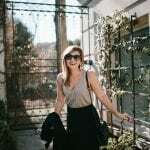 I’ve been testing out a new scheduling technique to keep myself on track since I’m officially my own boss now, and I think it’s helping a lot. Any big task I’ve wanted to complete so far this week has been completed – so that’s a good sign! But let’s chat about this outfit. It may be warm again today, but we all know it’s going to dip back down into the cold temps tomorrow. And then it will probably go back up again ? But what I love about this outfit is that it’s made up of super versatile pieces. I chose to style them into the outfit you see in the photos because it was sunny the day we shot it, and I loved the idea of putting these different textures together. 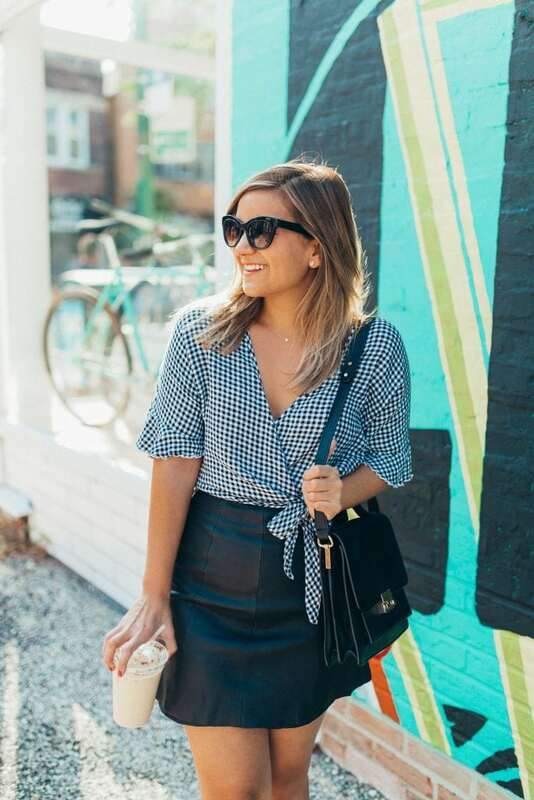 Sweet linen gingham + classic leather + slightly edgy studs + structured leather and suede bag. Such a fun combo, and exactly what I want to wear on a sunny Fall day. But what about when it gets chillier? This is exactly what I asked myself when I got these photos back and it switched from sunny Fall to freezing Fall seemingly overnight. It can be temping to just rent pieces like this, or put them away until Spring comes around again. But if you want to get a little more wear out of them – here are a few ideas! 1. Add tights to this exact look and swap the studded slides for booties. 2. Tuck a blouse into the leather skirt and pair with tights and pumps for a more professional look. 3. Wear the gingham top with jeans, a moto jacket, and either the studded slides or a pair of boots. 4. Wear the skirt with a chunky sweater and suede boots. 5. Ditch both the top and the skirt, and wear a sweater and jeans with the studded slides. Also, you might recognize this bag from this post with the palazzo pants (another fave!). I’ve actually been eyeing it for years, so when I saw it on Rent the Runway Unlimited, I couldn’t resist. Pretty sure it could make any outfit look chic! If you’re curious about Unlimited, I have a Rent the Runway promo code for you! Just enter LAKESHORELADYPERK40 to get 40% off your first month! A great option if you find yourself needing new clothes for work, or if you have a bunch of events coming up! How would you wear each of these pieces? PS. You might also like The Best Pants for Chilly Fall Nights and My Favorite Twist Front Sweater. *This post was not sponsored, but I did receive a free month of Rent the Runway Unlimited and I thought I’d share what I got!